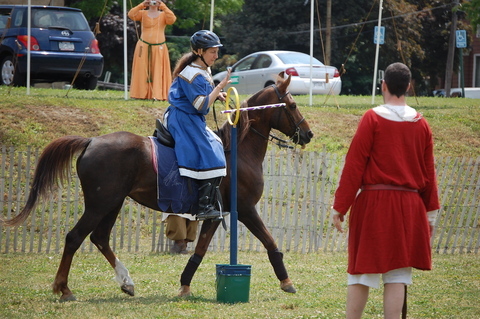 In Æthelmearc, the Kingdom Equestrian Champions are chosen once a year instead of every reign. This is because of the fact that during the winter reign there are few events which include equestrian activities. During the winter, the footing in most outdoor arenas is too dangerous for horses and unlike the other martial activities of the SCA, it is not as easy to bring equestrian activities indoors. Most sites cannot provide a large enough indoor space for horses. And because equestrian activities are usually added to existing events, most event organizers are not willing to rent an arena or conduct their other activities outside in one, even if it is covered. Therefore, it was decided several years ago that the Equestrian Championship would be held once a year in the early part of the riding season. Another difference between the equestrian champions and the champions of the other martial disciplines is that there is both a King’s and Queen’s Champion. The King is guided in his selection of a champion by the results of a competition which is run by the current King’s Champion. In the event the King’s Equestrian Champion is unable to perform this task, the responsibility passes to the Queen’s Champion, or the Kingdom Equestrian Officer. The Queen’s Champion is chosen by the Queen, strictly at her whim, though is usually based on such traits as chivalric behavior or courageous effort. The first Æthelmearc Equestrian Championship was held at Melee Madness on May 31, AS 43 (2008) in the Barony of the Endless Hills. The winner of that competition was Lady Rhiannon filia Catell who was declared the King’s Equestrian Champion. Khalek Shuurag Od was the King at that time. The Queen, Branwyn ferch Gwythyr, chose her champion – Lady Alexandra Caithnes. (Note: Titles for royalty are omitted here, as it can be assumed their titles were King and Queen at the time). Viscountess Rannveigr’s winning ride in 2009. The next year, during the reign of Maynard Von Dem Steine and Líadain ní Dheirdre Chaomhánaigh, the championship was held in the Barony of the Rhydderich Hael at The Brass Ring Thing demo and event on June 6th, AS 44 (2009). Viscountess Rannveigr Haakonardottir was named the King’s Equestrian Champion and Lady Ragnailt in Eich was chosen by the Queen to be her champion. Lady Marcan leading the procession. 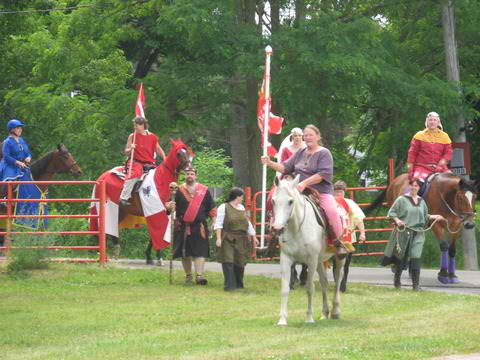 The Equestrian Championship was again hosted in the Barony of the Endless Hills in AS 45 (2010, on June 5th). Lady Marcan an Fhasaigh won the day’s competition and was named the King’s Equestrian Champion and Lady Alexandra Caithnes was called forth by the Queen to stand as her Equestrian Champion. Malcolm MacEoghain and Tessa the Huntress sat upon the Sylvan Thrones that day. 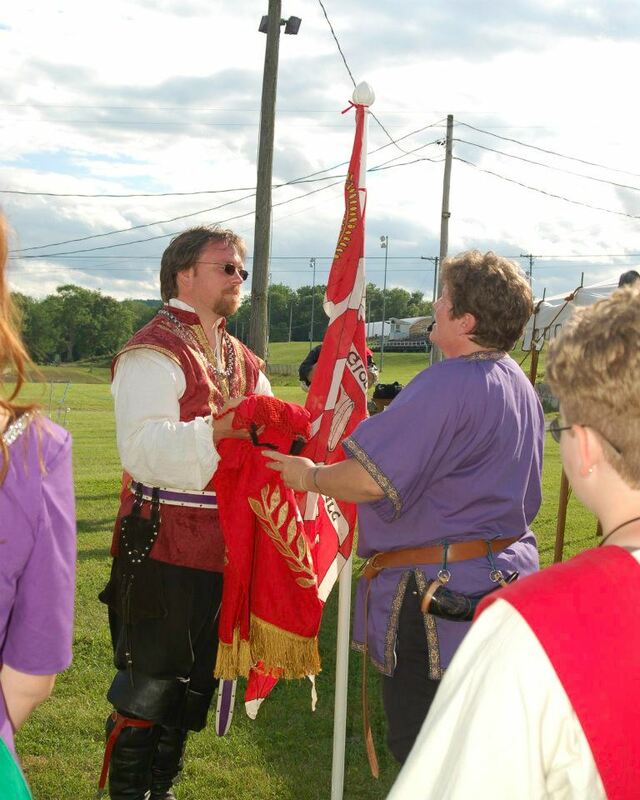 Lady Rhiannon passing the champion regalia to (then) Lord Tigernach. Photo by Michele Broton. 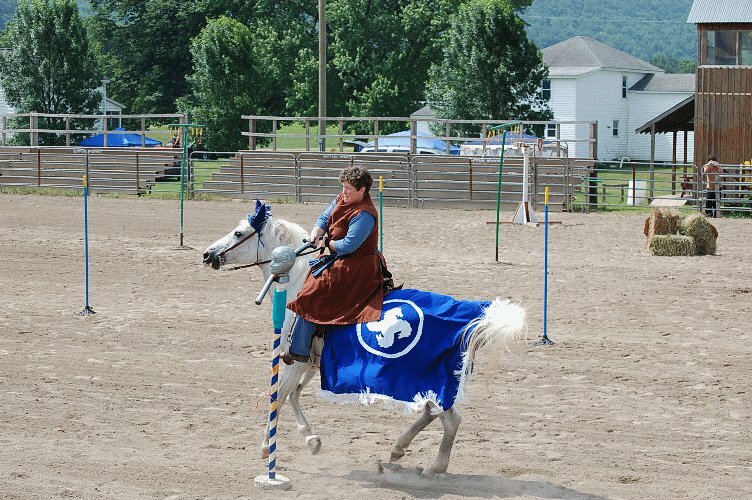 The Equestrian Championship of AS 46 (2011) was hosted by the Shire of Stormsport at their Tournaments Through the Ages event in Albion, Pennsylvania. On that 18th day of June, Lady Rhiannon filia Catell was declared the King’s Equestrian Champion and Mistress Ysabeau Tiercelin was named the Queen’s Champion. (She was an Honorable Lady at that time, as this preceded her Elevation to the Peerage.) This was during the reign of Christopher Rawlyns and Morgen of Rye. 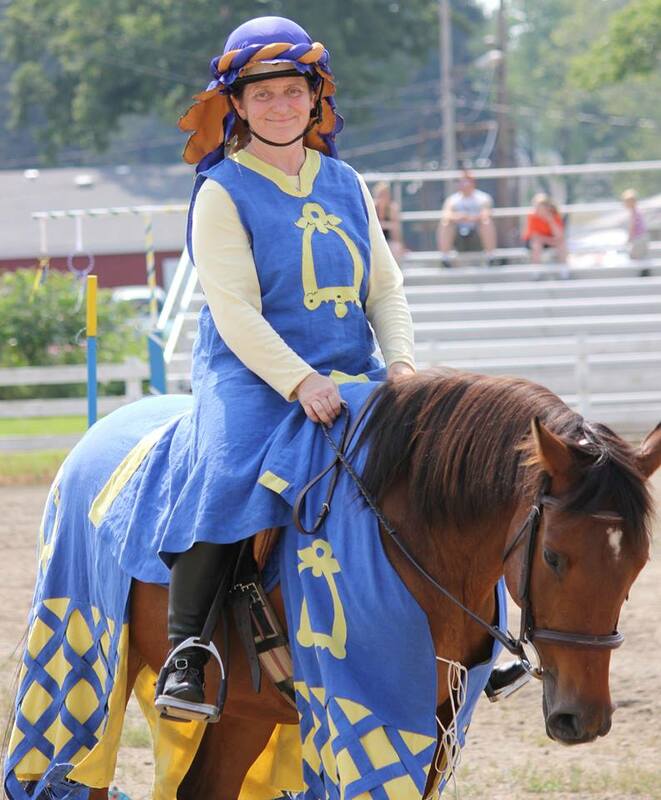 The following year the Equestrian Championship was again held at Melee Madness in the Barony of the Endless Hills. This event occurred on June 2, AS 47 (2012) and Andreas Morgan and Kallista Morganova, were King and Queen. Master (then THL) Tigernach mac Cathail was declared the King’s Equestrian Champion and the Queen chose Lady Gesa von Wellenstein as her champion. On June 22, AS 48 (2013), the Equestrian Championship was hosted by the Shire of Stormsport at Army Muster. 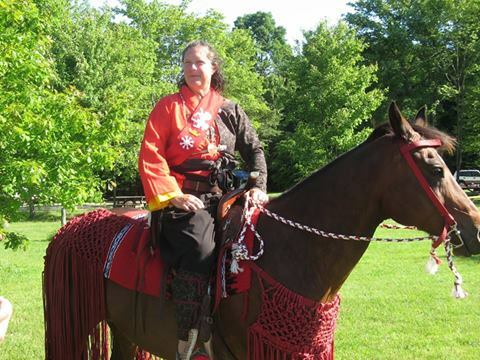 Mistress (then THL) Shishido Tora (Gozen) won the day’s competition and was declared by Maynard von dem Steine to stand as his champion. Liadain ni Dheirdre Chaomhanaigh chose THL Meadhbh inghean ui Bhaoghill to be her champion. The most recent Equestrian Championship was held during the reign of Magnus Tindal and Etain ingen Dalaig. The event was the Æthelwald Proving Grounds which was held on June 14, AS 49 (2014). This was the first time that the Shire of Sunderoak had hosted the Equestrian Championship THL Meadhbh inghean ui Bhaoghill proved victorious in the day’s competition and was named the King’s Equestrian Champion. The Queen chose THL Rhiannon Elandris of Glyndyfrdwy as her champion This year’s Equestrian Championship will be held once again in the Shire of Stormsport, at the Spring 2015 Æthelmearc Æcademy and War College event. This will take place on July 4, AS 50 in Albion, Pennsylvania at the Albion Borough Park and Fairgrounds. Once again, the sounds of thundering hooves will be heard as the riders of Æthelmearc vie with each other for the glory and honor of being named the King’s or Queen’s Equestrian Champion. Won’t you join us for a day of pageantry and equestrian excellence? 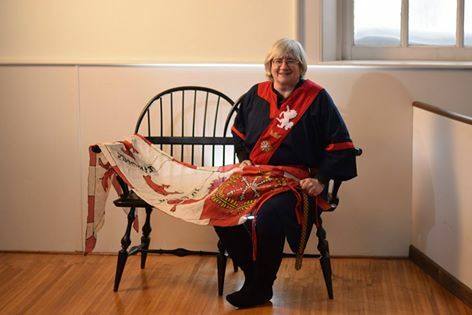 The current Queen’s Equestrian Champion with the regalia. Photo by Simon Peregrine. By Mistress Shishido Tora (Gozen).